Phillip is a mover and a shaker – literally! This adult with developmental disabilities likes to move. He lives at a residential facility in Delaware. Years of rocking in his manual wheelchairs have left a trail of destruction. 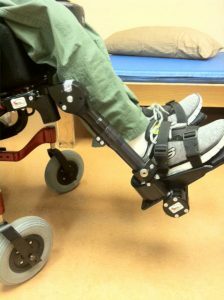 He has broken seating systems, mounting hardware, and wheelchair frames as a result of repeated and often strong movements. Phillip is currently using a tilt in space manual wheelchair with a linear back and an off-the-shelf cushion. When he rocks, he tends to move the entire chair across the room, so the staff lock the wheels. The result? He rocks with such force that the solid tires have repeatedly broken where they contact the wheel locks! Daniel is a 17 year old young man with the diagnosis of cerebral palsy. He has been successfully using dynamic seating for over 5 years now. He started with a Kids Rock dynamic manual wheelchair. He currently uses a tilt in space manual wheelchair with a dynamic rocker back and dynamic footrests. I sat down with his Mom, Mary, to ask her some questions.